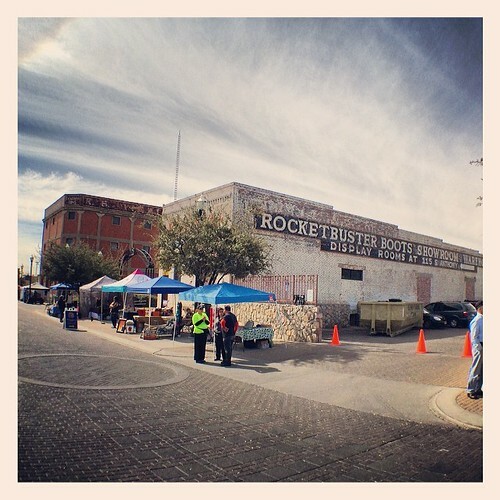 I spent some time this weekend at the Downtown Artist and Farmers Market in El Paso’s Union Plaza District. It’s been going on for a few years now and has really taken shape from its humble beginnings. While browsing around, I walked a few blocks over to see how the area has changed in the last year with all the recent development activity. 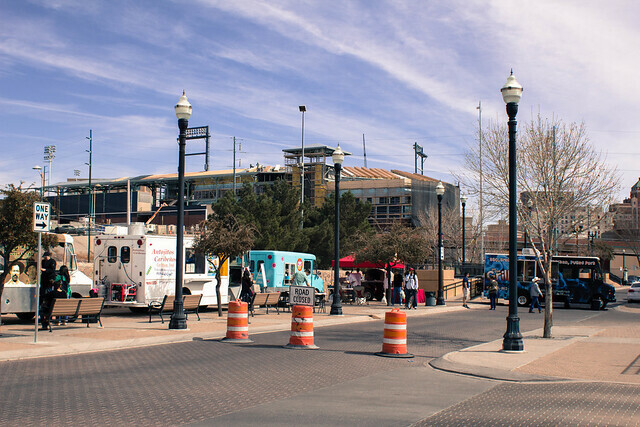 One new addition is a large pedestrian mall following Durango street from Overland to the site of the new stadium. There’s been a lot of talk about not having enough parking for the El Paso Chihuahua’s baseball games. 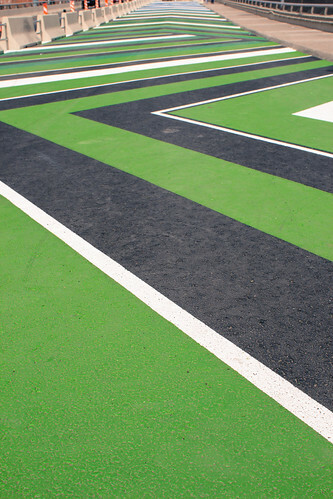 This looks like a good way to shuttle foot traffic up the colorful walkway from the downtown transit terminal across from the Civic Center. 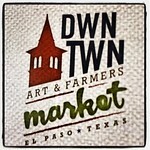 The artist market has grown leaps and bounds since the addition of the farmers market. Food trucks also frequent, parking down on San Francisco street, giving patrons plenty of grub to choose from. One thing that would really help would be if more of the businesses in the area would open up for lunch on Saturday (Hello! 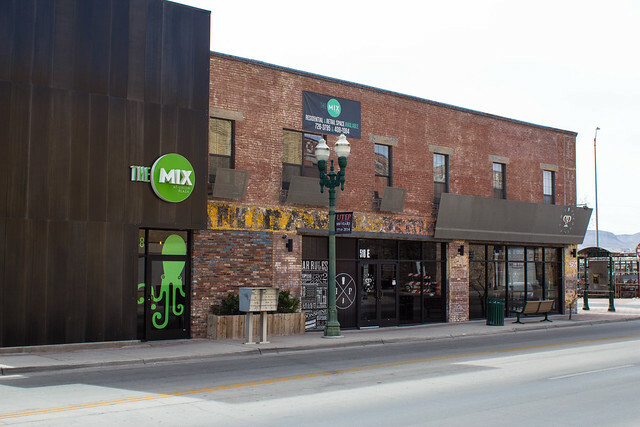 the Garden and Brick & Mortar…) On the corner of San Antonio and Anthony streets sits The Mix , a cool retail/ shopping venue. A few retail stores were open but a pub and nearby restaurant opened later in the afternoon. Bummer. With plenty of parking and new vendors, the Art Market is worth a weekend checkout. It’ll be interesting to see the area continue to grow once baseball takes hold downtown. There should be more to see and do as this and future seasons get going. 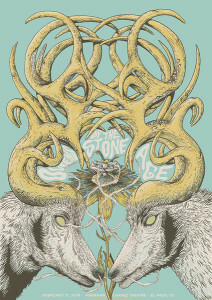 Queens of the Stone Age stopped in El Paso, playing at the Abraham Chavez theater on February 11, 2014. If memory serves me, they had only been here once before, in support of Songs for the Deaf. I didn’t go then and was quite surprised that they were coming back in support of …Like Clockwork. I didn’t want to miss this one, so I snagged a couple of tickets as soon as the pre-sale was announced. They opened with the fast paced “You think I ain’t worth a dollar but I feel like a millionaire“. That song still packs a punch even without Nick Oliveri on lead vocals. From there it was a non stop assault. Queens is a pretty tight band, and one of the few whose songs you can count on sounding excellent live. Josh Homme’s vocals have been the constant through the bands revolving door lineup over the years. I would wager he’s one of the current top rock vocalists. No auto-tuning or trickery required. The show lasted about an hour and 45 minutes and they did not disappoint. They came out for an encore and on the last song they literately brought the set down. Shortly after the start of the last song, Song for the Deaf, Michael Shuman knocked his amp stack to the floor, leading Homme to pull the drum kit down. Rock n’ Roll baby! If they come again I’ll definitely catch them next time. The Sun City has finally been getting some acts worth seeing. 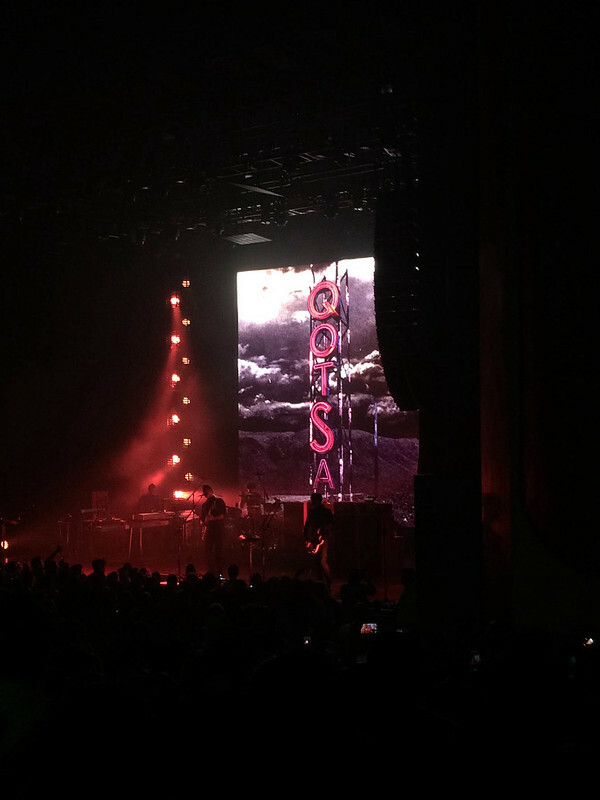 With last year’s NIN, and upcoming Old 97’s in May I guess IT IS ALL GOOD EL PASO.